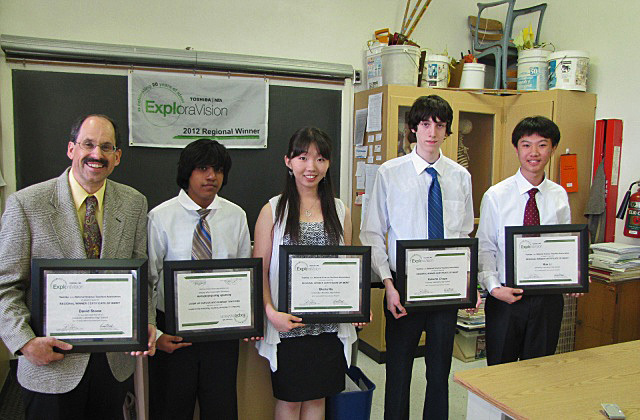 2016 Toshiba/NSTA National 1st Place Winning Team, From left to right: David Stone (Coach), Sarah Zhang, Joy Chen, Aditya Yedetore. Roma Rebei, Katie Tender (Mentor), Kennedy Cross (Toshiba, back). 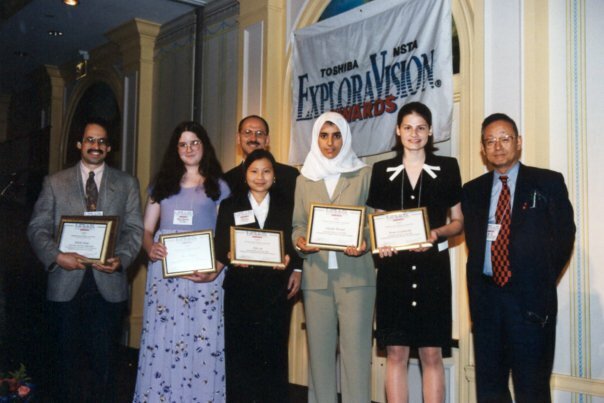 For the past twenty-one years I have used the Toshiba/NSTA ExploraVision collaboration model in structuring our school’s Extracurricular Research and Development Teams. The ExploraVision model encourages my students to take ownership in knowledge they’ve acquired and collaboratively apply that knowledge, combined with their creativity, to solve real world problems. I currently coach eight to twelve student research and development teams, comprised of two to four students, each year. 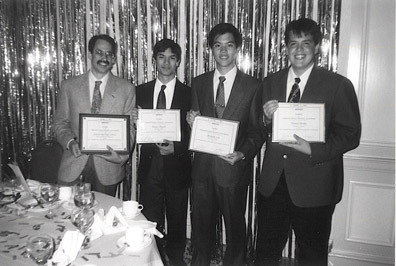 Over the past twenty-one years, ten teams have placed first in the grade 10-12 division regional competition. Our region consists of nine states and Canada. 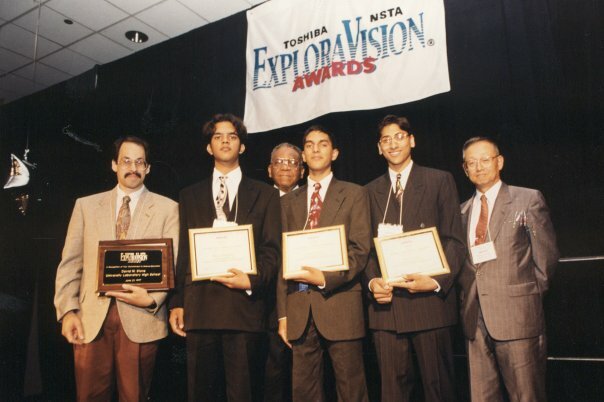 Of those ten teams, five have gone on to win the Toshiba/NSTA ExploraVision grade 10-12 competition (1996, 1997, 2009, 2010, and 2016) and one placed second in the final round of the competition (1998). Uni High has the best record of any school in this competition with students earning $200,000 over that time. Toshiba/NSTA ExploraVision competition requires groups of two to four students to collaborate in the development of a future technology prototype, research background regarding the current technologies incorporated, discuss technological strides required for their proposed technology to become a reality, assess the potential positive and negative societal impacts of their technology, and develop a set of five storyboards for presentation of that technology. Students research the issue, current technologies associated with that issue, historical background behind those technologies, develop a collective vision of how the issue can be addressed within the next twenty years, and assemble that vision into a single overview document with five storyboards that they will incorporate into a website should they move to the final round. A complete first round entry consists of a paper not exceeding eleven pages in length and the previously mentioned set of five storyboards. The paper must include an abstract, a present technology overview, history, future technology section including the scientific principles involved in the workings of their proposed technology, required scientific breakthroughs, a brief summary of three alternative ideas or features considered but rejected, a summary of the team’s design process, an overview of both positive and negative consequences of the proposed new technology, a bibliography, and five web graphics that communicate and promote their future technology vision. Style and storyboard requirements are clearly stated. Every year deviation from those requirements results in disqualification of many teams. The second round of the competition requires students submit a web site dealing with their technology, that can be viewed in its entirety in five minutes or less. The web site must include a one to two minute video explaining the workings of their proposed technology. Each first-placed team member in each of the four grade-level divisions receives a $10,000 savings bond, while students on the second-place team each receive a $5,000 savings bond. Members of the top two teams in each grade level division, their families, teacher-advisor, and an optional community advisor are awarded all-expense paid trips to Washington, D.C., to attend the Toshiba/NSTA ExploraVision Awards Ceremony and to meet state and national government officials. Eight years ago the National Science Teachers Association began hosting webinars involving NSTA staff, and past winning coaches. These webinars are of value to both new and experienced coaches. Mine can be found at http://learningcenter.nsta.org/products/symposia_seminars/ExploraVision/webseminar5.aspx . 2016 Toshiba/NSTA National 1st Place Winning Team, From left to right: David Stone (Coach), Sarah Zhang. Joy Chen, Aditya Yedatore, Rima Rebei, Katie Tender (Mentor), Kennedy Cross (Toshiba, back). The Bionic Eye Implant for Sight ( BEISight) is a visual prosthesis designed for longterm use by people who have damaged or deteriorating retinas. It replaces the majority of the eyeball with a partially removable prosthetic containing a clear solar panel, two cylindrical cameras, and an image-to-electrical signal converter that sends signals across magnets to an electrode array implanted in the epiretinal membrane. The technology builds upon existing retinal prostheses by dramatically increasing the number of electrodes in the array implanted behind the retina, thereby improving the level of detail that users are able to discern from phosphene images. Combined with recent innovations in solar panel technology, BEISight will fuse compactness, efficiency, and durability with an overall higher quality visual experience. Asthma is an incurable inflammatory respiratory disease that affects an estimated 300 million people worldwide and causes over 250,000 deaths per year. Current treatments, such as long-term preventative medications and quick-relief inhalers, are insufficient because they do not prevent attacks from occurring on-site and are ineffective for some patients. NADAPTechnology’s two part system will reduce the frequency of asthma attacks. The first component, an internal sensor that will detect serum eosinophil cationic protein and an external sensor that will detect proteins in allergens, will provide an early warning for a likely asthma attack. The second component, a magnetic nanoparticle-based treatment, will interfere with the pathobiology of asthma, preventing the inflammatory compounds from being released. TEVIA Tech incorporates eight technologies into a smartphone base to form a breakthrough assistive device for the visually impaired (VI). 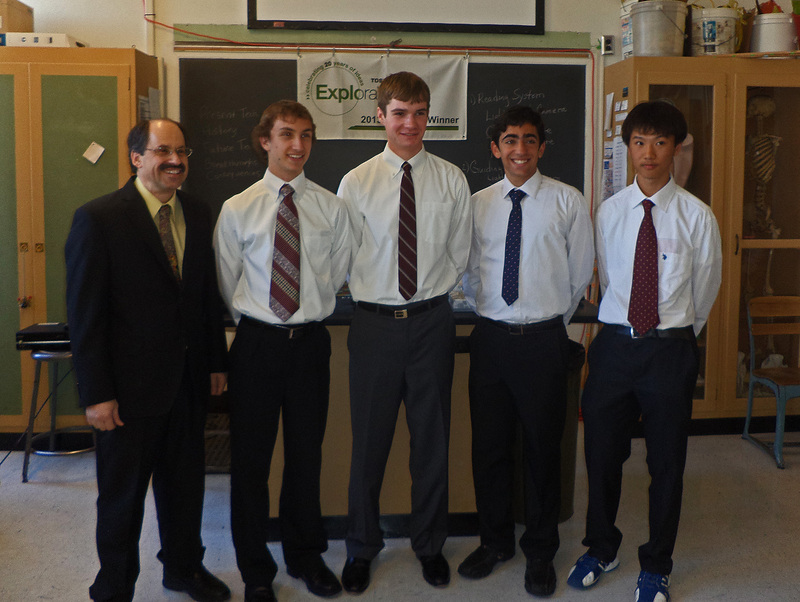 2012 Toshiba/NSTA Regional Winning Team, Left to right: David Stone (Coach), Ananth Nandakishore, Gloria Ha, Roberto Chapa, Max Li. MIROR Technology utilizes an innovative in-womb robotic technology to repair cleft lip and/or palate defects diagnosed during the third trimester, eliminating any future need for operations or rehabilitation. Incorporating seven different technologies, the NIBEye promises to significantly improve the quality of life for vision-impaired individuals throughout the world. HEARTt is a specific, cost-effective, easily-administered treatment for atherosclerosis. Synthetic High Density Lipoprotein (sHDL) attached to a protein, ingested and released into the bloodstream, blocks plaque-forming Low Density Lipoprotein interaction with body cells, allowing sHDL to carry away the dangerous cholesterol in the plaque. A replacement organ for people suffering from cardiovascular disorders, this heart uses nanotechnology so that it can be constructed of the patient’s own tissue. Incorporating smart hydrogels, amorphous silicon photoreceptors, signal processing hardware and tissue scaffolding, AVReS is a highly advanced prosthetic eye. Biodegradable polymers, a shape-memory alloy and nanotechnology result in a limb that mimics DNA and actually regenerates blood vessels and nerves. This is so awesome. Thanks for your help. I commend you for your perseverance and good work,you deserved the 1st price .